After seeing Carrie at the La Mirada Theatre for the Performing Arts this past weekend, I understood immediately why the 1988 Broadway production went down in history as one of the most notable and expensive flops of all time. There is simply no world in which this musical is a Broadway show, but that does not mean there is not a way to tell this story onstage. La Mirada has nailed it in the new, re-imagined, immersive production directed by Brady Schwind that opened on March 18th. 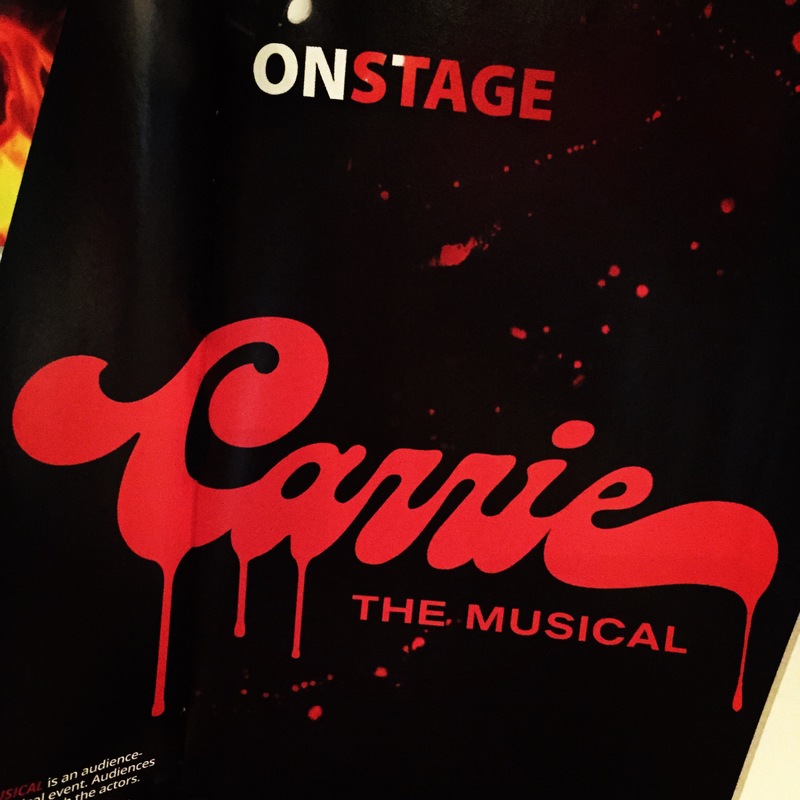 Carrie: The Musical first opened in England before transferring to Broadway. It ran for only 16 previews and 5 performances, during which there were often boos mixed in with applause and technical difficulties involving the all-important blood compromising the microphones during the climactic prom massacre scene. In 2012, the show was re-worked for an Off-Broadway revival. Seven songs were cut, new ones were written, and the narrative structure was adjusted—in the new version, the story is framed by a traumatized Sue Snell recounting to the authorities what led up to the fateful night of prom. This new 2015 production expands upon these changes even further. 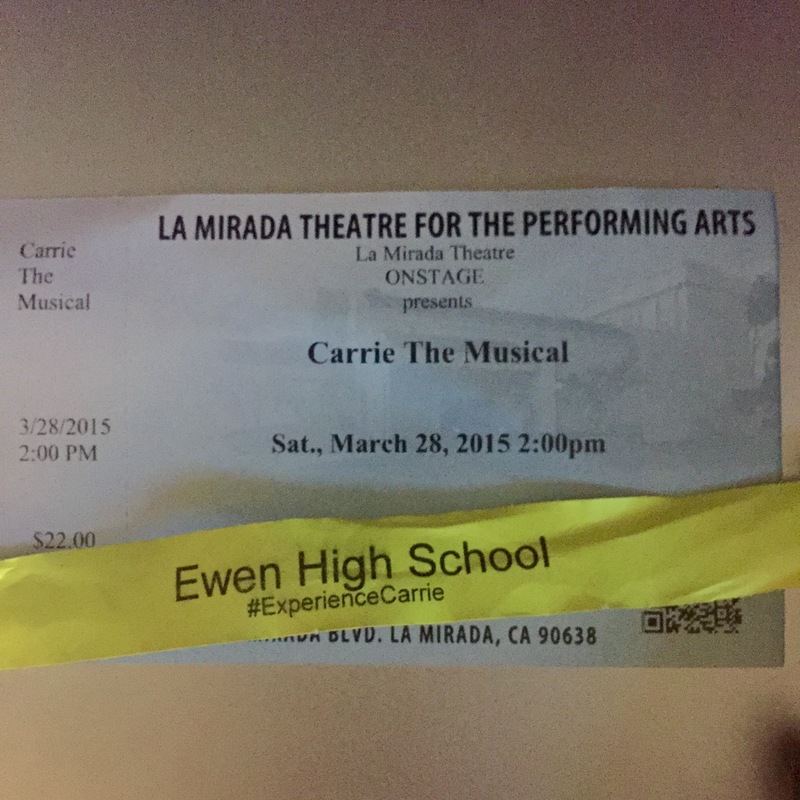 From the moment you enter the La Mirada Theatre for the Performing Arts, the ushers welcome you to “the high school” and you are given wristbands, color-coded by seating section and nicknamed “sophomores,” “juniors,” and so on. The entire backstage area you walk through to reach the seats has been transformed to look like the high school in the aftermath of the tragic events, with bloody hand prints mixed amongst the desks and books. The tone is set immediately, and I couldn’t believe how utterly unrecognizable the theater, where I have seen several other productions, looked. While most of the audience is seated on two opposite sets of bleachers facing in on the stage, four pod-like seating sections on the floor are moved and rotated by the cast throughout the performance, giving those audience members the feel of moving along with the action. The back of the stage also features multi-story scaffolding on which action also takes place. During act two, when a wall gave way to reveal an expanded gymnasium set decorated for the prom, nearly doubling the size of the stage, the audience actually applauded because it was so unexpected and impressive. At this point, several audience members were also invited to dance at the prom by the cast members, really bringing the immersive experience full circle. The production also features some truly impressive effects and wire work—considering the intimate size of the space, which seats only 250 in this configuration, the wires were some of the most truly invisible I’ve ever seen. The cast is all-around fantastic. The ensemble represents a very accurate cross-section of the types of people you would find in any high school, and the leads all embody their characters with finesse and talent. Emily Lopez is both vulnerable and threatening as needed and makes you feel for her Carrie almost immediately, which only adds to the sense of foreboding that encompasses the entire show. Misty Cotton gave probably my favorite performance of the production as Carrie’s mother Margaret, displaying impressive vocal chops and the appropriate level of crazy in a thankless role. Kayla Parker was charming and appropriately girl-next-door-esque as narrator Sue Snell, while her love interest Jon Robert Hall (Tommy) stole many of the scenes he was in. Valerie Rose Curiel was unapologetically evil as bad girl Chris and had an impressive belt to match, and Jenelle Lynn Randall received many laughs for her humorous and sincere performance as Carrie’s gym teacher and confidante Miss Gardner. In terms of the music, I found that interestingly enough, the songs I found the most catchy were amongst the ones added for the 2012 revival (“The World According to Chris” and “A Night We’ll Never Forget” have both been stuck in my head). Perhaps it’s because these songs have a much more modern pop feel and suit the updated version of the show, which takes place in present day and incorporates both selfies and social media. The thing that struck me the most about the production is that while Carrie is obviously a classic horror story, in this version the horrors of Carrie’s telekinetic powers and eventual mass murder almost take a backseat to the much more relatable horrors of high school. In its purest form, Carrie is a story about the dangers of bullying. In a society where horrible stories of children and teenagers who take their own lives due to bullying are in the news far too often, this outlandish tale becomes surprisingly grounded in reality. I mean, of COURSE video of Carrie’s shower incident was immediately posted to social media to further humiliate her, because that is sadly the world we live in now. In so many ways the plot lends itself to a modern adaptation such as this one, because if you take away the telekinesis and supernatural elements, Carrie’s story is the story of too many high school students. A moment that stuck with me is when Margaret reminds her daughter that she is “special.” So much has been written about the potential detrimental effects of calling children special with several studies showing it may set them up for a life of narcissism. Carrie’s situation is obviously both fictional and extreme—most children whom are deemed special are not locked in closets frequently or raised by religious zealot mothers who find all men evil and untrustworthy. Nevertheless, while aspects of the musical may feel dated, in many ways the story at its core is more timely than ever, and it is exciting to see a production that zeroes in on the relevant aspects as successfully as this one. 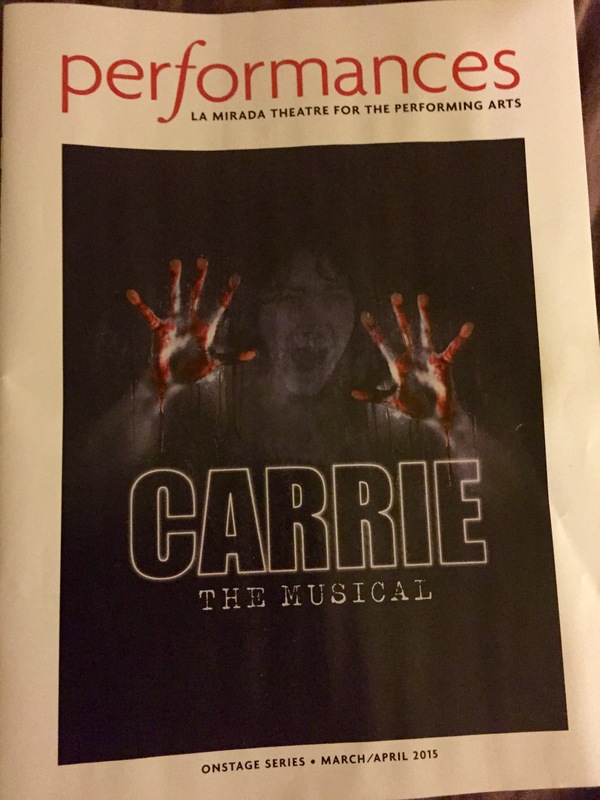 Carrie runs at La Mirada through this Sunday, April 5th, but there are reportedly plans in the works for this staging to be recreated elsewhere. For more information and a link to purchase tickets, visit www.experiencecarrie.com. Those are EXACTLY the two songs that have been in my head for days! Love this review. I’ve been listening to them on the 2012 cast recording non-stop ever since! Thank you for reading!